An obsession with anniversaryism conceals a lack of creative and inclusive thinking in Scottish – and English – political thought. 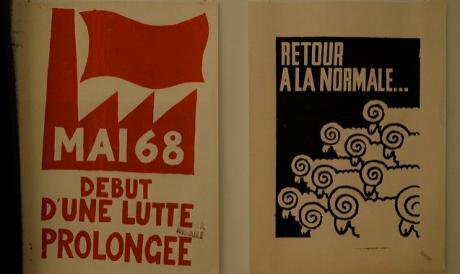 Image: Posters reading "The start of a prolonged struggle" and "Return to normal", from the Paris uprising which sees its 50th anniversary this year. So Trump isn’t coming to visit the UK after all. But 2018 will be the year of Trump and Brexit nonetheless. Both are mutually reinforcing echo chambers. Trump may be an outlier as a person, but sadly Trumpism – meaning right-wing populist raging against everything – existed before him and will continue long after him. I returned from a reflective Christmas break in an insular, inward-looking US, to the familiar Brexit cacophony on these shores. It’s clear that in 2018 Brexit will continue to be shaped by contested versions of what country we are talking about. One version first is England as Britain – which blithely ignores that only England was a real driver for Brexit (with Wales a reluctant hanger-on), and Scotland and Northern Ireland pro-EU. This is the Daily Mail version, as in last year’s front cover ‘Who will speak for England?’ which included in the text this explanation: ‘By England … we mean the whole of the United Kingdom.’ The second version recognises that distinctive English reaction to Brexit as different from the rest of the UK. This England as Britain versus England alone versions of Brexit cause faultlines even on the left: Owen Jones and Anthony Barnett representing these different accounts. Barnett’s ‘The Lure of Greatness’ is one of the most powerful polemics exploring the populist English uprising appropriated to Brexit. Barnett’s analysis was cited at length last week in a Guardian editorial. But the Guardian ultimately reduced it to the usual liberal prospectus of addressing English malcontents by such showstoppers as House of Lords reform and federalism. The next day Owen Jones in the same paper addressed why it was delusional to believe that (as Tony Blair had again suggested) it was possible to reverse Brexit. Good so far, but then (as so often on the English left) came the dog that doesn’t bark - and some seem to want to keep muzzled - England. Not one mention of England, or the pro-EU sentiments of Scotland and Northern Ireland. Ignoring England is a dominant strand amongst the English left – one that unites both Blair and Corbyn. Scotland can often appear as a sideshow in all this. Our own fire and fury post-2014 has become something of a stuck record. Returning to these shores, I once again heard voices continuing to bash any view that doesn’t fit their own view of Scotland. This propensity isn’t exclusive to any side or opinion, but hurts independence more because it is meant to be about change and vibrancy. Take Derek Bateman, BBC anchor for 30 years plus, railing against how effective non-SNP parties were with their press releases over the break and alleging conspiracy. When challenged, Bateman got personal - calling the Sunday Herald’s Paul Hutcheon ‘a wee man’. SNPer Gordon Guthrie observed that such an outlook made the Nationalists ‘the ‘whining the press is against us party’’ which if pursued is ‘a death spiral’. Or take Herald columnist Kevin McKenna declaring that for the Scottish establishment, independence is ‘produced.’ This is the sort of exaggerated stuff which people write when they get lost in their own comfort blanket. Never mind historical challenges to the British state and establishment such as Irish independence. A final example can be provided by the permanently offensive Wings over Scotland site who decided to yet again show his insensitivity on trans issues. It is a decent list but what it doesn’t say is equally important. It talks about attitude, but says nothing of content. A politics of mutual respect is a good thing but without putting ideas centre amounts to little more than Kumbaya Scotland. The elephants in the room are several: the lack of any new independence package or work on a plan; the SNP’s incumbency and safety-first control politics; and the lack of a politics of ideas in wider Scotland which hampers both independence and unionism, but hurts the former more as the politics of change. Then there is Brexit which lays a whole pile of grenades under everything. Leckie’s menu must be combined with content and a politics which adapts to the times. The referendum was the biggest exercise in political education Scotland has ever seen in its history. And yet some, in the aftermath, seem not to want to not build on this or to challenge their own assumptions. Thus, for some Yes evangelists all that matters is repeating the incantations of 2014 as if this was a divine moment of wisdom in our nation and all they have to do is wake the people from their slumber. There is a desperate need to be honest, brave and challenge power – whether the Tories and British state or the SNP. Take the architectural critic Gavin Stamp who died in December. He was a coruscating scourge of the architecture and conservation mafia and from a place of expertise and principle, an informed cultural troublemaker. But where and who are the cultural troublemakers of our present, and indeed troublemakers in any subject? In place of such risky enterprise here like elsewhere in the Western world we have the obsession with anniversaryism: the listless pursuit of remembering and being defined by past glories and moments. This will be to the fore this year: the 50th anniversary of 1968: the assassinations of Robert Kennedy and Martin Luther King, along with the Prague Spring and Paris Uprising. Even 1968 is invoked in parts of Scotland’s left and independence currents to mark the supposed need for boldness, but more often to invoke the workerist romancing of a past set of supposed certainties. Scotland will have its own rather more mundane anniversaries this year: 30 years since the publication of ‘A Claim of Right for Scotland’ which made the case for popular sovereignty and 20 years since the Scottish international football team last appeared at the World Cup or any other tournament (along with 40 years since Ally’s Tartan Army met its sad fate in Argentina). We currently have a Scotland of doldrums, inertia and a phoney war while all around there is the crashes of institutions and traditions. Some older warriors who became blooded in previous conflicts continue to fight the last war. Similarly, too many see the world through trench warfare and the idea that one side with its fixed positions can overcome the other lot and achieve total victory. The Scotland of the future isn’t about 2014, 1979, 1968 or 1917. There is no Year Zero. It is being made in the here and now in all its imperfections. We live in a world of constant change, uncertainty and disruption. The march of AI and automation will wipe out millions of jobs: 44% of all UK jobs being at risk according to an IPPR report. This is used to validate the limited prospectus of linear optimism: the idea of tomorrow as a better version of today with just more stuff: more smart products, marketing and connectivity. It is a false optimism posing that we can’t dream of better tomorrows. The riposte to this cannot be to still cling to old certainties and pose a better yesterday: of a little Britain of Scotland as our future. Instead, we must embrace uncertainty, ambiguity and doubt, and use these to find the vision, voices and vessels of the future: our community of the realm for the 21st century. While we can invoke the imagination and idealism of New Lanark, George Square in 1919 and UCS, it will not look anything like them. The future is that exciting and daunting, but meanwhile from Trump to Brexit to Scotland too many voices want to seek out the answers in romanticising the past. This is understandable in conservative and reactionary circles, but in those who call themselves left, socialists and social democrats, and who aim to liberate and emancipate there must be a higher ambition. Namely, of not being mesmerised and prisoners of an imagined past which never existed in the first place. There is a future world to be made and not ceded to reactionaries or techno utopians.